Aromatherapy is a massage form that uses special healing essential oils originated from plants flowers, leaves and herbs and traditionally been used for healing stress, reviving emotionally correlated conditions and even infections. 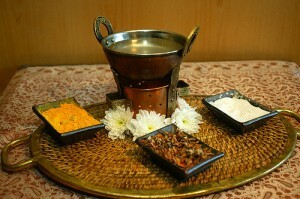 The scent of essential oils are inhaled and also put on and massaged on the skin. Please be aware that aromatherapy oils are not perfume or fragrances. Perfumes are chemicals that are artificially manufactured, and don’t have the healing and therapeutic components of aromatherapy healing oils. If you have been to massage places that uses scented candle lights, don’t be confuse, this not aromatherapy at all. We highly recommend aromatherapy massage specially for individuals with mentally draining jobs or students before and after exams.